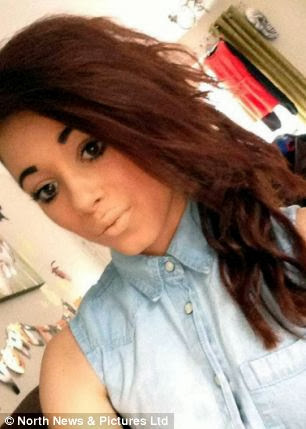 Schoolgirl, named online as Sarah Clerkson, found hanging at house party. She was taken to hospital in North Durham where she later died. A 14-year-old girl has died after she was found hanging at a house party in an apparent suicide that online tributes say was sparked by bullying. The schoolgirl, named on social networking sites as Sarah Clerkson, was found at an address in Spennymoor, County Durham, on Saturday evening. She was taken to the University Hospital of North Durham where she later died. Thousands of mourners have joined groups on the site to pay tribute to the teenager. Some posts claimed Sarah had been targeted by bullies because of jealousy over her looks. One person wrote: 'That is why she would get bullied, because she is stunning, jealousy is a terrible thing. 'The bullies who did this should come forward and take their punishment and ask.fm should be banned. According to the Northern Echo, Sarah, who was originally from Sunderland, was attending a party at the home of a 16-year-old boy. She was put to bed after being sick, the report said, and when someone checked on her some hours later, there was no reply and the door had to be kicked down. According to the report, there was alcohol but no drugs at the party. A 16-year-old boy who had been at the party told last night how he tried to save the teenager. The teenager said everyone at the party had been 'concerned' about Sarah after she had been put to bed after being sick. Detective inspector Wendy Tinkler, of Darlington Police, said: 'Attempts were made to resuscitate a 14-year-old girl at a house in Spennymoor. Police have said a report has been prepared for the coroner. For confidential support contact Samaritans on 08457 90 90 90.